The Industrialization Curve: Where Do Indian States Stand? The shares of agriculture, manufacturing and services in GDP reflect the development of an economy. 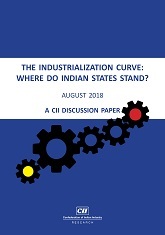 This paper from CII Research unpacks the sectoral profiles of large Indian states to provide an idea of the current status of their development and lists some key areas to be addressed for better regional economic balance.